Consumers who purchase a qualified Crimson Trace laser sight from a dealer, online, or through the Crimson Trace online store at www.crimsontrace.com, can take advantage of this offer. There is a limit of one redemption per product purchased. Additional details on this offer can be found on the company’s website. The Crimson Trace Rail Master CMR-201 universal red laser sight features Instant Activation™ –the popular Tap-On, Tap-Off operation — and the product packaging includes four insert adapters to ensure a secure and proper fit onto pistols, rifles, and shotguns with M-1913 Picatinny and Weaver-style accessory rails. The small and lightweight CMR-201 universal laser sight is packaged with a battery, the mounting hardware, and an owner’s manual. To participate in this offer, purchasers simply complete and submit to Crimson Trace the proof of purchase form found at www.crimsontrace.com along with the receipt and the UPC bar code from the packaging. To obtain the free Rail Master CMR-201 red laser sight, all terms and conditions of the program must be met. Once Crimson Trace verifies that purchasing conditions have been met, the company will ship the complimentary Crimson Trace Rail Master CMR-201 laser sight directly to the purchaser. 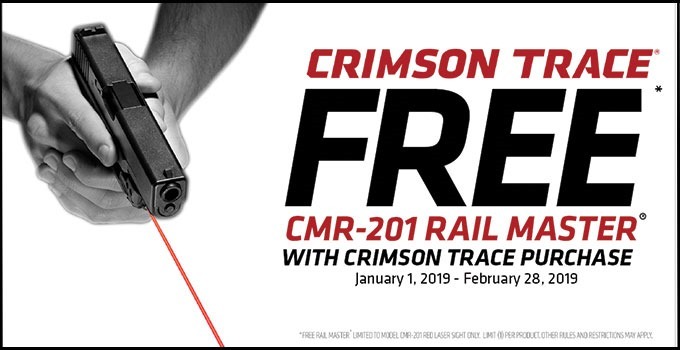 Additional details on the terms and conditions of this BOGO promotion are available at Crimson Trace dealers across America and on the company’s website at www.crimsontrace.com. This entry was posted in Promotions and tagged CMR-201, Crimson Trace, CTC. Bookmark the permalink.